To provide comprehensive yet easy to understand science material. Maintain excellent standards of visual design to allow the site to be simple and enjoyable to use. Provide content for a wide audience: reaching beyond our inital UK audience. 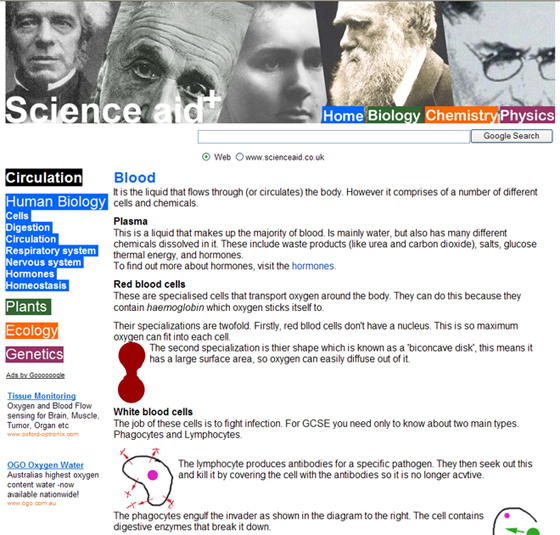 Science aid was launched onto the web on Monday 13th March 2006 and since then has provided thousands of students around the world with comprehensive yet easy to understand science material that will enrich their minds and enhance exam results. The site is the product of a GCSE student who wanted an interesting way to revise that would encourage revision and not be an irksome task as revision often is. And as such the site has a unique perspective on the way that teens think and how to best represent the information. Note the huge list of every single topic, including those that were yet to be created, the page had no set dimensions, so looks very wide when using a large screen, forcing you to read long lines. The logo was rather unimpressive, so much so, I am afraid, that I do not have it anymore so it is not displayed in the above image. 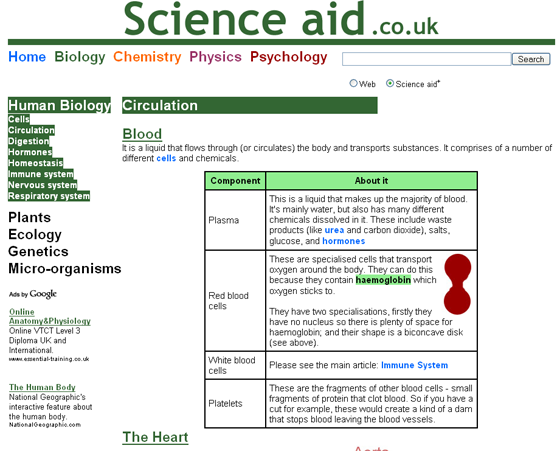 The second generation of science aid was launched on 11th June 2006 with a greatly improved design. The below screenshot shows the same page as previous, but in the new layout. The 'second generation' design has a set width of 900px that is centred. There is a nice big title image above that is interactive since you can navigate to the sections, and it includes the logo imbedded within it, this title image changed but finally settled something similar to what you see above. The navigation is all on one side with the page title at the top, and all of the topic headings, the article links are below the topic that you are in. 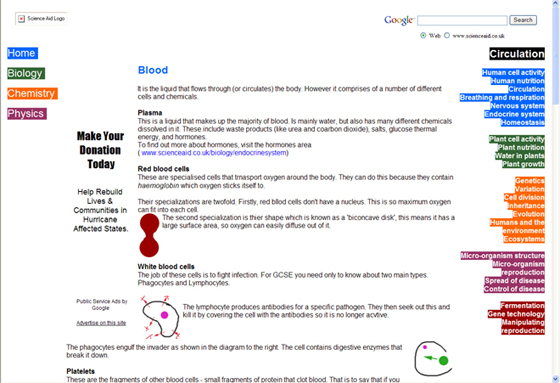 So for example, the image shows a human biology page, so all of the human biology pages can be reached from here. A culmination of several minor adjustments over many months has resulted in the evolution of a third distinct layout where there is more homogeneity in colours and an overall more sophisticated appearance which continues Science Aid's commitment to interesting visual design. Major work was also done reorganising the categories and removing our previous multi-tier system. A screenshot of the same page exampled is shown below.